Empire Medical Training is proud to announce the availability of a true Board Certification Pathway for Physicians and Nurses through the American Academy of Procedural Medicine. You now have the opportunity to enhance your credentials and become Board Certified in areas of medicine that include; Aesthetics, Anti Aging Medicine, Weight Management Medicine, Pain Management, Surgery and more. In today’s competitive health care market, physicians must learn to differentiate themselves from other practitioners through various channels including the pathway to becoming Board Certified. 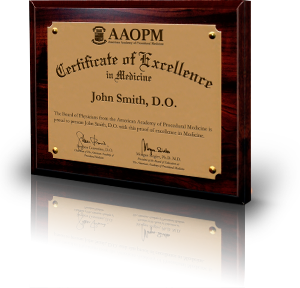 How can I become Board Certified through the A.A.O.P.M.? Start by joining the American Academy of Procedural Medicine and utilize the Free educational materials and videos offered on the A.A.O.P.M website. The A.A.O.P.M. is an educational organization with a commitment to providing physicians training tools and information to enhance their skills and credentials. As a member, you will be provided with a private user name and password to access this information. Attend the minimum required courses for the specialty you are seeking. (see below). Complete all written and oral exams and receive a passing score of 80%. Provide (2) case studies on actual patients you have treated and evaluated. Start using these techniques in your practice. There is a minimum of 6 months experience required in order to sit for the oral and written exams. The Attendance that is required is different depending on the specialty and Board Certification pathway you choose. For Aesthetics, you must attend 4 fundamental classes in Aesthetics. For Medicine, attend any 3 fundamental classes, for Pain Management attend 2 classes and the same applies for Anti Aging Medicine and Weight Management Medicine. The American Academy of Procedural Medicine offers Diploma Certificates as part of the process of Board Certification. These Diploma Certificates are awarded upon successful completion of the mandatory classes. Participants must receive a minimum passing score of 70% on the Practical Exams which are taken online and at the completion of each course. These practical exams must be taken within 14 days of the actual course. The last step in becoming Board Certified through the American Academy of Procedural Medicine is to pass your ORAL and WRITTEN exam. Each exam is approx. 1 hour in duration and you will be proctored by a Physician instructor during these exams. The Oral exam follows the format of an instructional type oral exam; however, students must demonstrate proficiency during the exam process. The oral and written exam must be scheduled in advance, however, these are offered just about every month throughout the year. Board Certification is an integral step in achieving excellence in a newly learned specialty. Your patients will be seeking for qualified physicians and becoming Board Certified is no doubt an effective method of distinguishing your credentials. Successful graduates will receive their Board Certification Certificate as well as 2 metal and wood “wall plaques” to display in their office. The Board Certification plaque is an oversized and very attractive element that you will add to your office setting. For those who understand the importance of marketing will appreciate our “Physician Locator” This functions like a search engine and assists patients who are searching for the services you offer in your geographic area. The Physician Advisory Board who oversees your training and testing is comprised of 5 member Physicians who actively participate in the process. Their credentials and Bio’s are listed on the AAOPM website; Dr. Anne Roberts, Dr. Stephen Cosentino, Dr. James Avellini, Dr. Earn Romane, and Dr. William McMunn. For more information, you may contact the A.A.O.P.M. directly at 954-358-2858. Empire offers certification for Physicians and Dentists (MD, DO, DDS, DMD) of all specialties, as well as Nurses, Nurse Practitioners, and Physician Assistants. Empire is renowned by health care professionals and credentialing agencies for our established reputation and quality of the certification pathways we have available. Whether you need to apply for malpractice insurance, gain privileges at your local hospital, impress your patients with your credentials, or just looking to ensure your resume will list credentials that most employers will recognize, you can feel confident that your certification with Empire Medical Training will be recognized above all others. Empire Medical Training is THE recognized leader in providing medical and aesthetic certifications worldwide for over 13 years. Since 1998, Empire has trained over 30,000 health care professionals such as Physicians, Dentists, Nurses, Nurse Practitioners, PAs and many others as well. Empire Medical Training programs are comprehensive and prepare each attendee to receive their certification. Although no written exam is required to receive your certification, each attendee must demonstrate a level of proficiency during the hands on portion of the training. Empire has over 200 programs scheduled throughout the country each year in order to ensure the training sizes remain limited to no more than 25 attendees. Interactive discussions with the instructors are an integral part of all Empire training programs and remain a deciding factor when issuing your certification. Liposuction Surgical background mandatory, attend minimum 2 Surgical Programs, including 1 advanced 3 day preceptorship, perform minimum 4 cases supervised with instructor, additional training may be required. “Continuing Medical” Certification Attend minimum 3 medical programs such as Dermatology Training, Anti Aging Training, HCG Training, etc. 1. To get your membership with the AAOPM select the membership registration option below and pay the associated fee ($399 or $299). 2. To begin the Board Certification Pathway, the $499 Board Certification Fee must be paid from the start. The additional fees (Membership & Exam) can be scheduled but must be paid within the next 6 months. Please select the date you wish to have these payments mafe (see below). Please check all that apply and submit payment. Board Certification Exam fees do not need to be paid in advance. I agree to the terms & condtions and understand that there are absolutely no refunds. Member plaque will be shipped to you within 14 business days. Certification certificate will be mailed withing 14 days after your successful completion of Board oral & written exam. Make sure your name & degree are written correctly, there are not refunds for errors. This charge will appear as AAOPM. This agreement and all actions arising from it shall be governed by / construed in accordance with the laws of Florida. The undersigned agrees that any actions arising from agreement will be settled in Broward County, Florida, and the prevailing party will be entitle to attorneys fees.